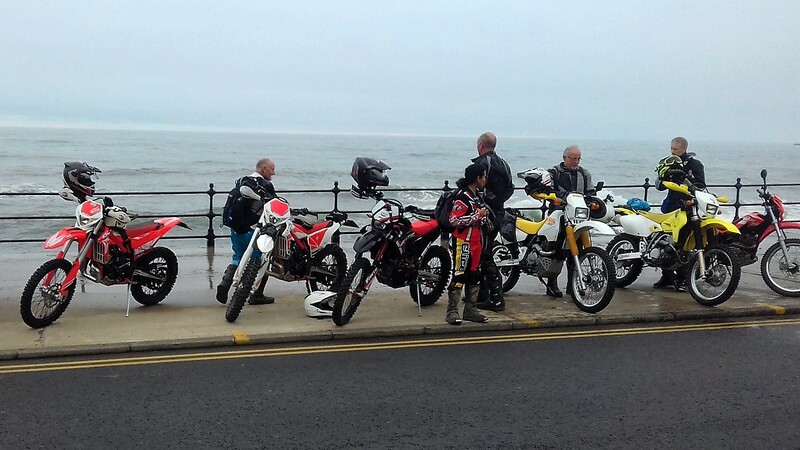 Did you know that Teeside & North Yorkshire group organise an annual coast-to-coast ride between Scarborough and Morecambe? 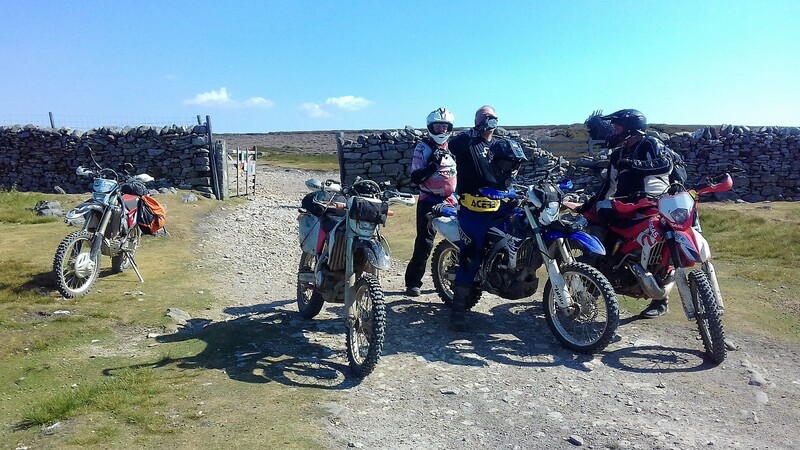 In 2010 I planned to do the TRF North Yorkshire Moors camping weekend but being of the adventurous type, and not having a van or trailer, I thought I would ride my trusty DRZ400S all the way from Bristol using as many green roads as I could find along the way. It was to take 2 days calling in to see my dad in Hull on route. However I was thwarted after 220 miles and 12 hours and only about half way, by that sneaky devil exhaustion getting into bed with overconfidence. I crashed & broke the radiator near Coventry. 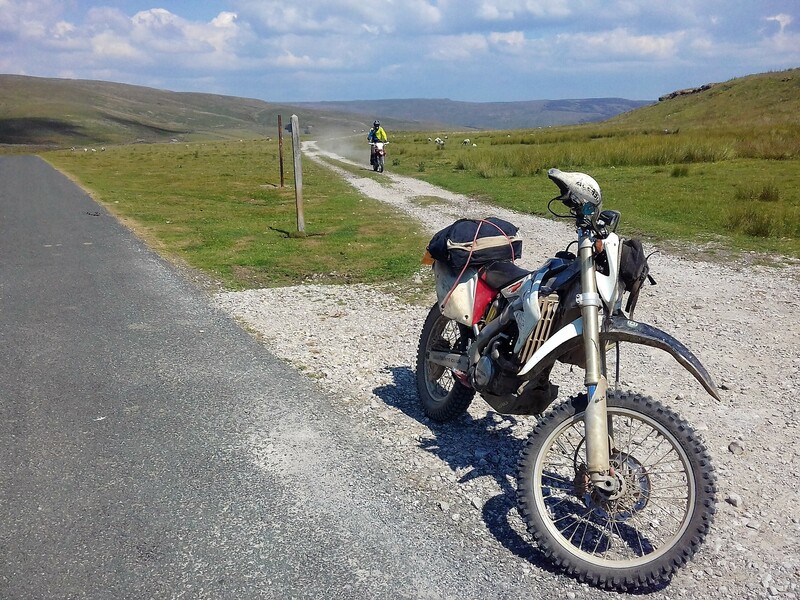 I mooted the idea at a club night to attend the Teesside & North Yorkshire TRF Coast to Coast Event in July 2018 starting in Scarborough riding two days to Morecambe bay. Myself and Dave Vaughan were joined by Ian Hardy who volunteered to drive us in his luxury van. 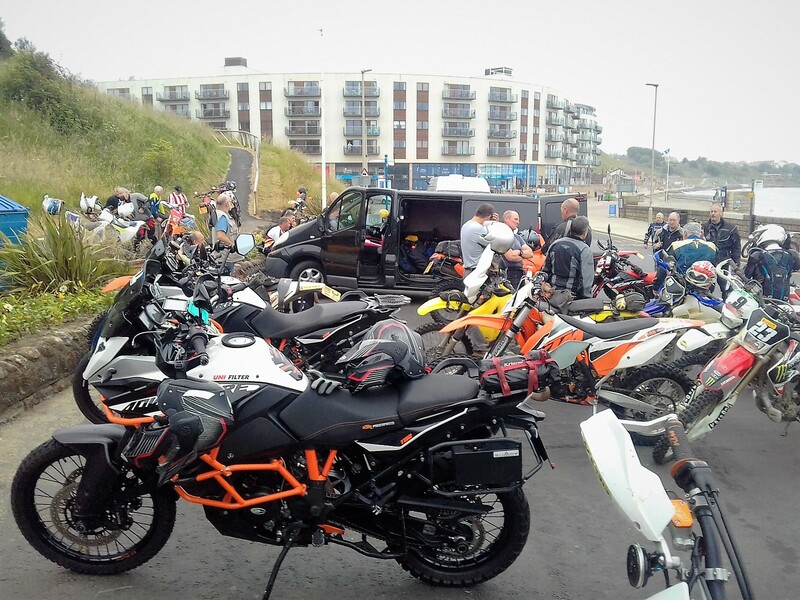 The event was, curiously, mid week starting from Scarborough promenade at 9am on a Wednesday, riding a circuitous route across the Moors and ending at Scotch Corner Travelodge for the night. Thursday would be a similarly circuitous route across the Peak District ending in Hest Bank. I had understood that some of the participants were staying at Hest Lodge for the night whilst (most) others would ride home, being presumably from the locality, but as we needed to return to the van at Scarborough and rather than ride the 200 odd miles on tarmac we were to retrace our route exactly taking a further two days getting back to the campsite in Scarborough for Saturday night. That 4 full days trail riding! But there was more to come. The Scarborough Camping & Caravanning Club campsite wouldn’t let us leave the van for a few days or even book us in for Saturday night as it was Scottish holidays - why that was relevant for booking a campsite escapes me. Early Wednesday morning, after parking the van in a salubrious local housing estate, we met the other riders at the Watermark cafe on the north promenade. There were quite a few big trail bikes to be seen but the majority were the usual TRF choice being 250-400cc enduro bikes. 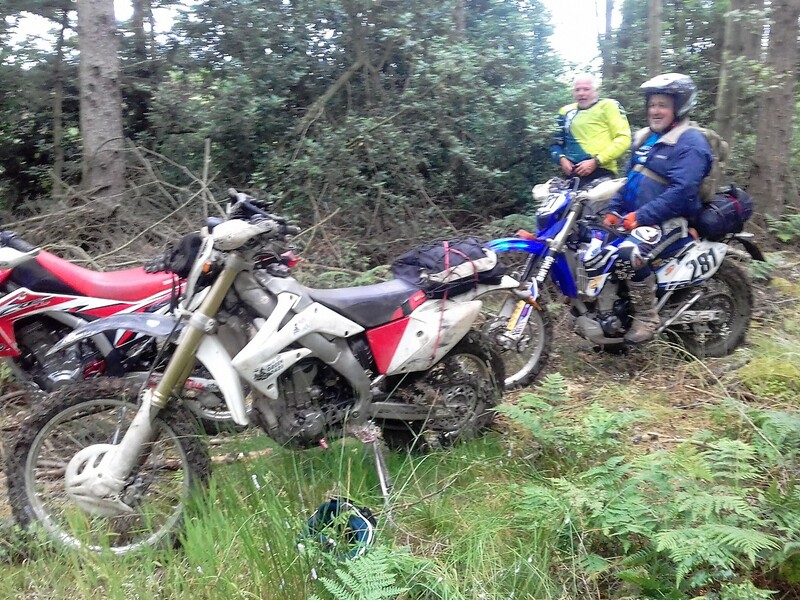 We had the only bikes fitted with Trials rear tyres – a group mindset of the south westerners it seems. 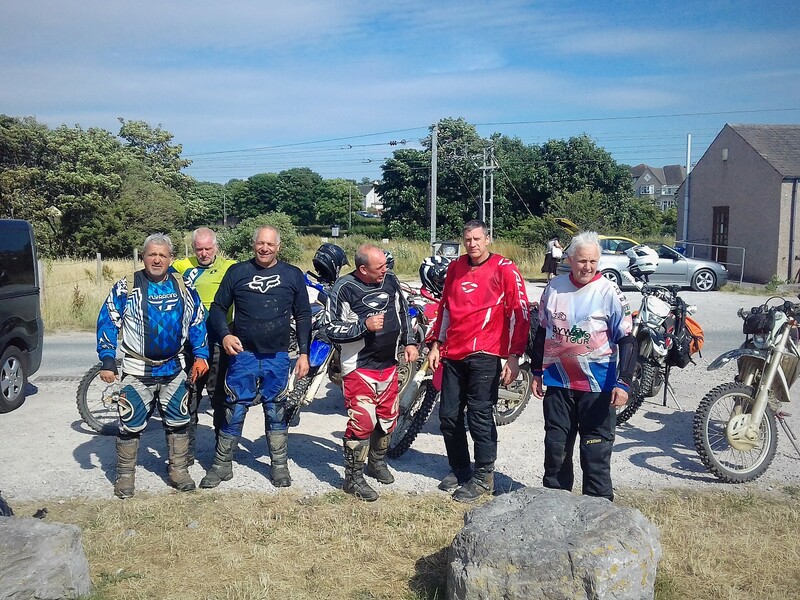 The 2018 event was attended by around 35 riders in groups of around 6 each with a local-ish guide. Setting off from Scarborough seafront. 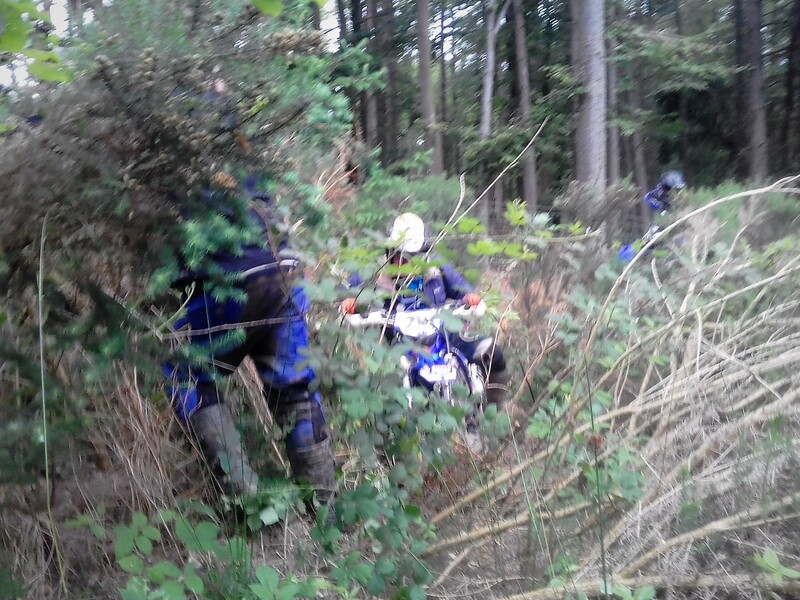 It began to drizzle as we set off into some dense undergrowth hiding treacherous ruts. This was riding of a type familiar to us but was unexpected as we were expecting immediate wide open tracks with panoramic views; patience! I believe our guide judged us all (correctly) as being competent to cope and said it wasn’t on the route for big bikes or incompetent riders which was something perhaps would have been discussed had any of us looked like snowflakes at the beginning. Ian making his own track. Ian managed to get the wrong side of a ditch and had to make a new path through the scrub and out onto the open track at one point - 'lane clearing', I think it's called. As the day progressed the sun came out and the route took us higher up in to the NY Moors proper. 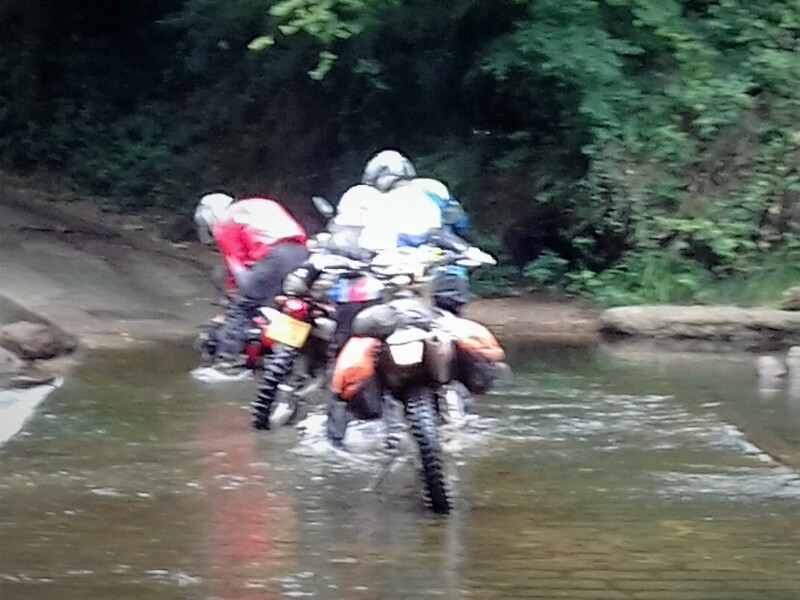 Just before lunch at Grosmont steam railway station an innocuous ford managed to topple two of our group who decided to have a little get together and a lie down to cool off in the 4” of slimy stream, resulting in a bent gear lever on the CRF250L. Something to be said for steel levers as an alloy one would have snapped clean off! David Vaughan on the moors. 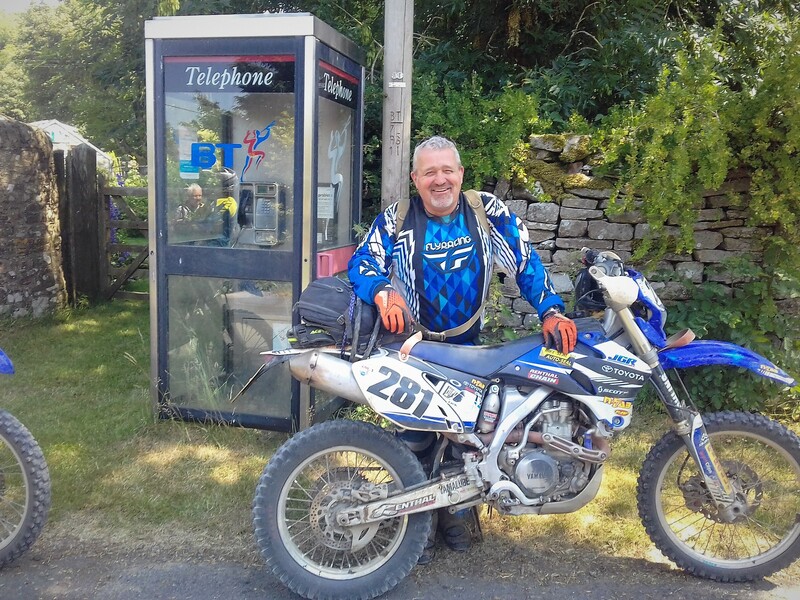 After a fuel stop at Kirkbymoorside we rode the famous 9 mile dusty trail northwesterly to Inglby Bank. This is an awesome trail reminding Dave of Arizona’s trails apparently and certainly more akin to somewhere abroad, the scorching weather probably helped. 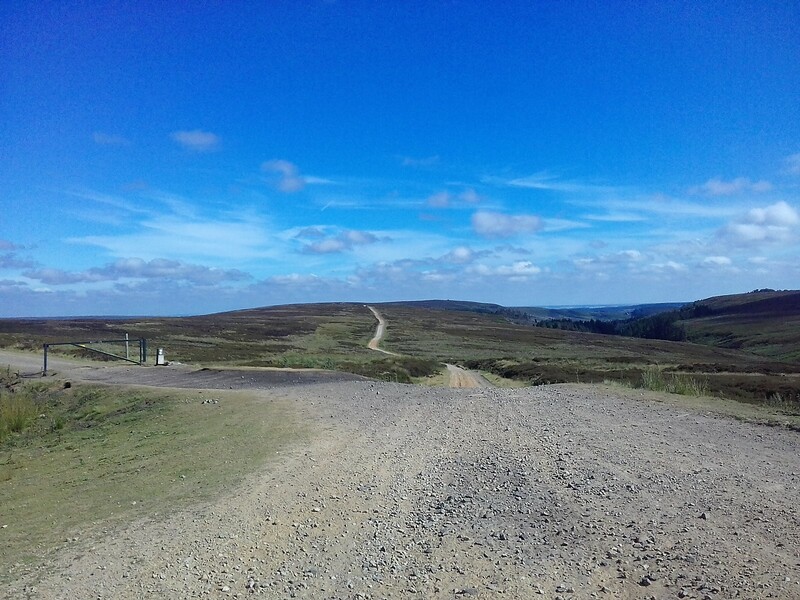 The nine mile moor track. 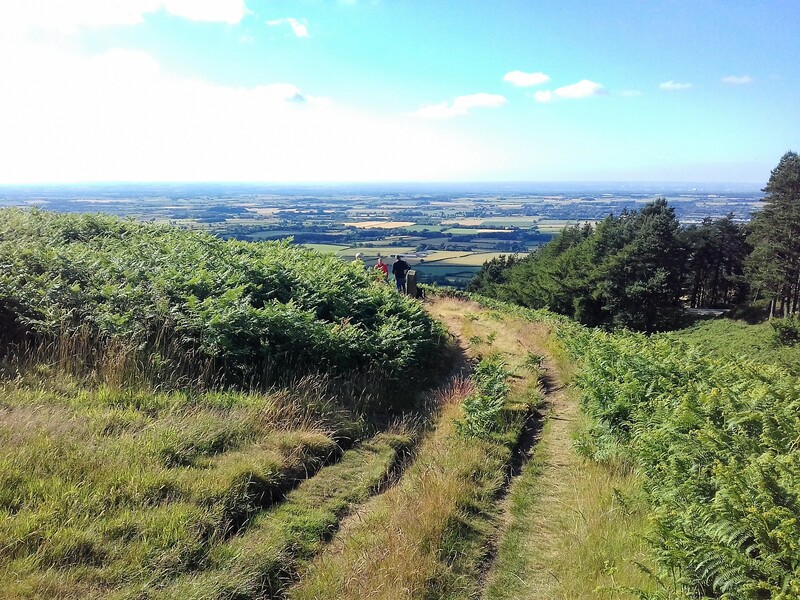 A further set of stunning climbs and moorland lanes looped around to bring us down from the fine views of Teesside to the vales and hamlets that occupy that part of England ending with a 40 mile road stretch to Scotch Corner Travelodge. Looking north from Cringle Moor. We did 140 miles in 10 hours and our arses confirmed it! 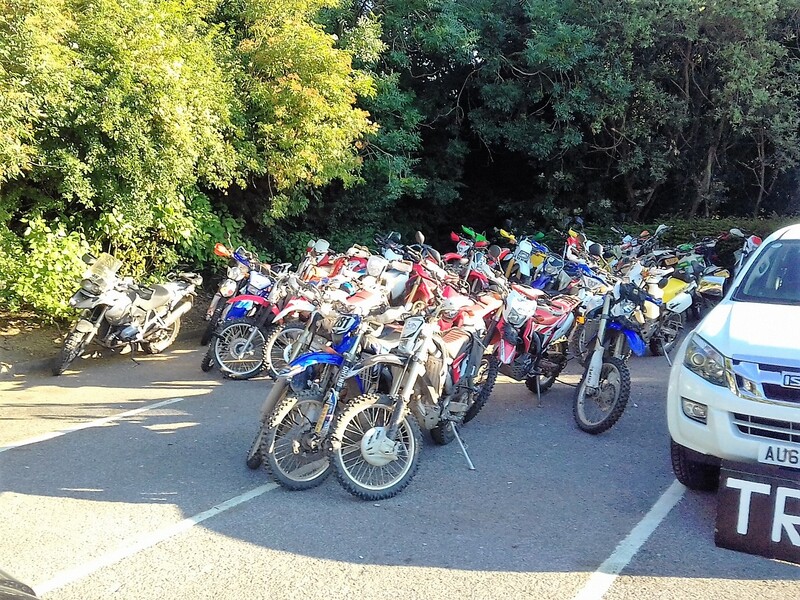 The TRF had laid on some poor volunteer to sleep in his van in the car park as a security guard for the many bikes parked in the corner by the side of the Travelodge itself, though most bikes were chained together in groups it was a nice and necessary precaution in a motorway services area. Scotch Corner is a place we’ve all heard of but probably never been or at least never been to the village itself or to be more precise, the pub in the village of Scotch Corner. It is gorgeous - go! Awaking early and after the usual fettling - why do we do this in the morning and not at the end of the day? As any problems encountered in the morning lead to delay and frustration of the others! 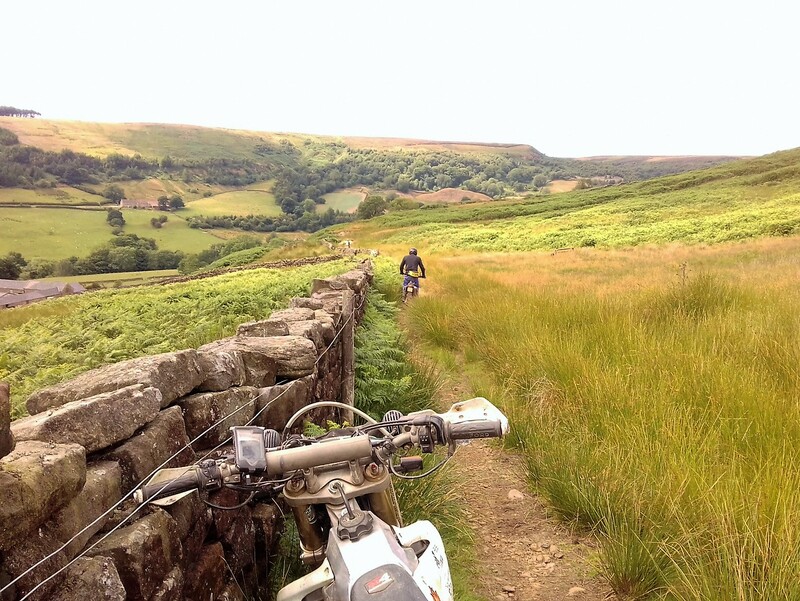 And so to the Peak District area trails, familiar from many years ago when I lived in Hull and rode a Transalp 2-up on some of it before deciding I had the wrong bike! 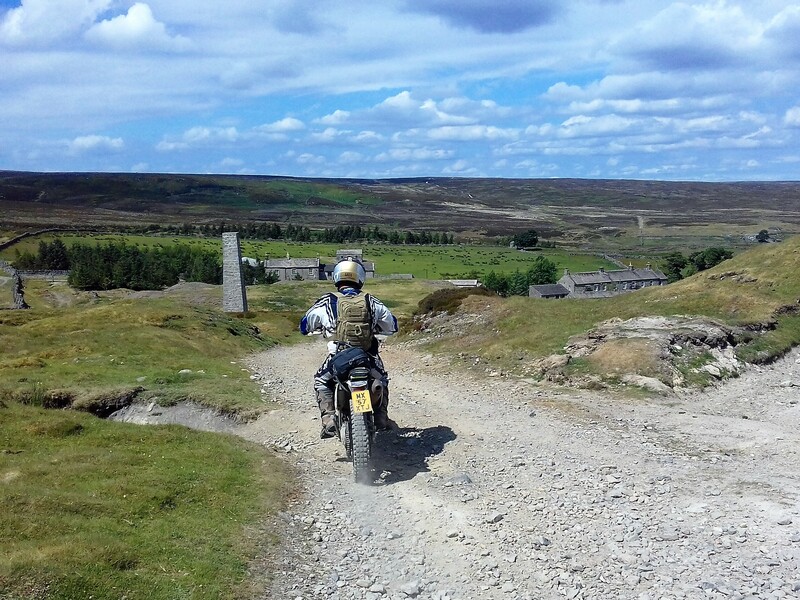 The descent from Fremmington Edge into Arkengarthdale was interesting and with fantastic panoramic views. Lunch about 2pm was at Hawes where we had iced coffee and Bakewell tart. So good it's worth doing again Ian! The first lane out of Hawes over Dodd Fell was a B’stard with tales from the locals of 100ft snowdrifts and the like. As it was it was 400degC and we perspired mightily. The trails were just gorgeous though with plenty of wide open track and views to die for. We passed Pen-y-Ghent which is one of the iconic mountains of the area when it was pointed out that my subframe bolt was missing. Fortunately I had a spare bolt so no drama. How does a random frame bolt come loose after 4 years and 10,000 miles? We eventually reached Morecambe Bay and had our picture taken. The setting sun meant we couldnt get a decent bay shot though. We had done 115 miles in 8 hours this day. The finish at Morecambe Bay. 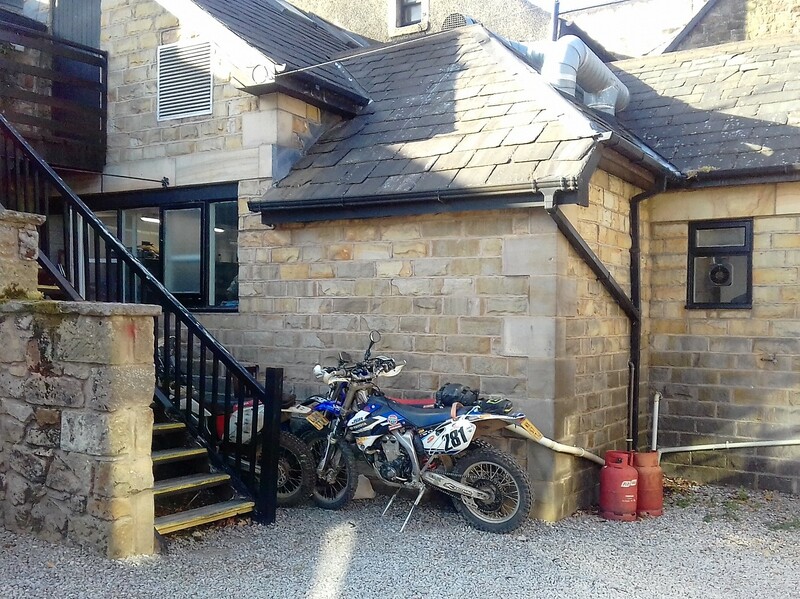 We had booked the Hest Lodge and were the only bikers there, our bikes nestled behind the kitchen extractor fan for added security this time. And so the two day 2018 Teesside Classic Coast to Coast ride was over after 255 miles of mostly dirt track - but it wasn’t for us hardy souls, we were going back the way we’d come! Now the real challenges began. We had tracked the route on Viewranger on my £60 phone as well as Dave’s £400 Garmin Montana we expected to be easily able to retrace our route. The Garmin however wasn’t playing and on my trusty 10 year old phone we relied. The only real problems in my opinion is that the screen is a little hard to read in bright sunlight (it is plugged into a fag lighter on the bike for power). We avoided the first (last) lane as it was an overgrown 100 yard rutted track that we didn’t want to tempt as a first lane. 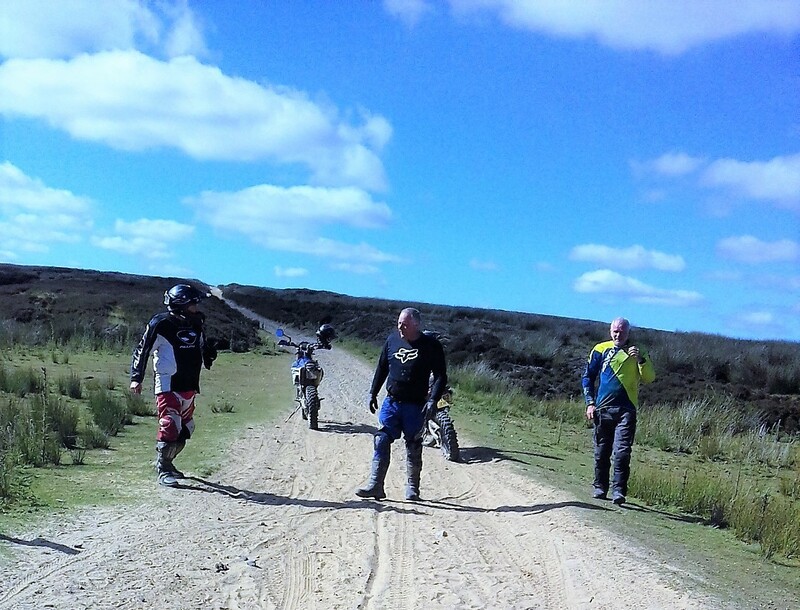 We rode about 20m on tarmac to pick up the trail at Melling. We knew the tracks were all do-able of course but we also knew we’d have to be extra cautious as complacency and tiredness can easily get together and ruin your day. Things look different going the other way too so while the GPS showed we were on the right track it was sometimes puzzling with many exclamations of “I dont recognise this bit!”. The bouldery nightmare down Dodd Fell to Hawes was quite unremarkable compared to going up it, such are the different experiences when going the other way! We again had iced coffee and Bakewell tart on Hawes - of course. 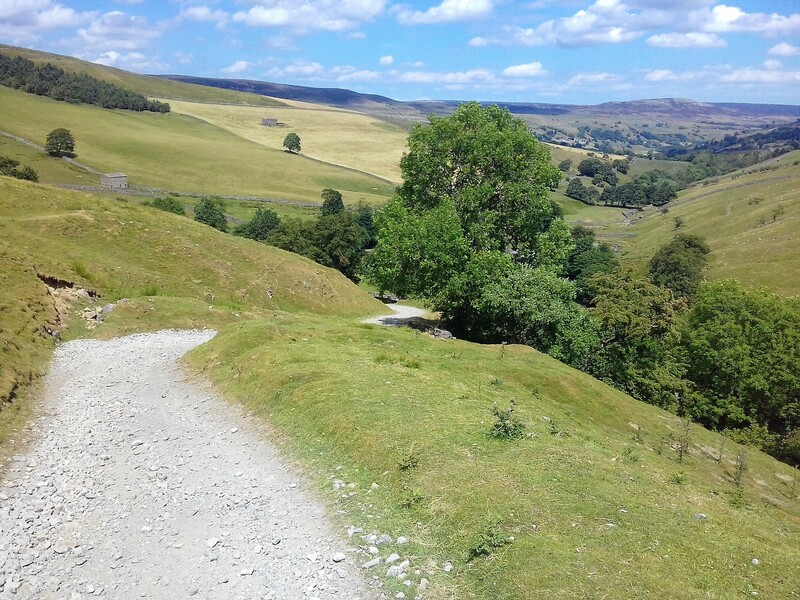 Next the climb up Fremmington Edge to the ridge above Reeth with the amazing panoramic views. And so on back to Scotch Corner Travelodge again. As there was no TRF security this time we decided to get the bikes round the back and chained them together just outside the bedroom windows. More a case of out of site really but as none of our bikes are orange we were sure no one would try to steal them. 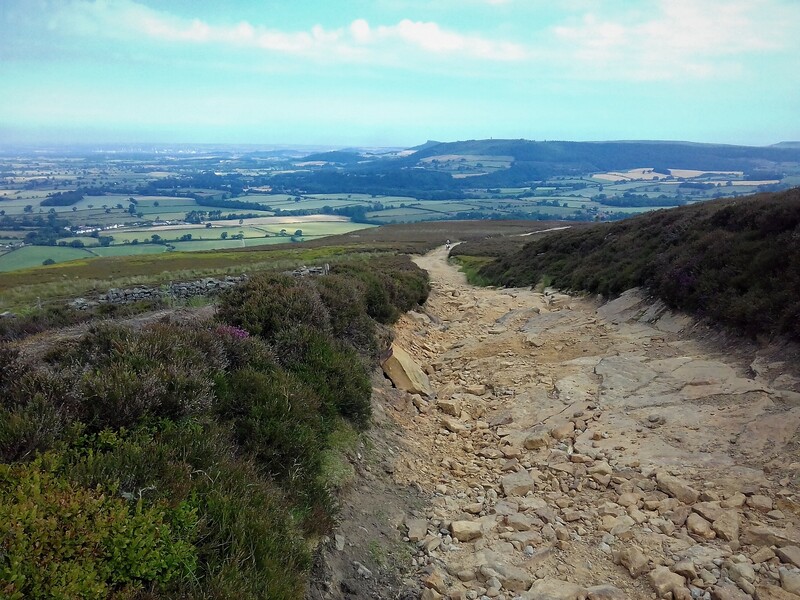 Again retracing steps exactly to the North Yorkshire Moors and up Inglby Bank, Dave’s fatigue started to show itself but fair play to the man. Above the bank is the 9 mile dusty trail again and we decided to spread out to avoid breathing all the dust which was nice as we each had that feeling of solo riding miles from anyone. A rather nice lunch stop at Kirkbymoorside in the blazing sunshine followed by a refuel and a look at the route options. We wanted to get back to the campsite and pub by 2pm to watch the England game at 3pm. We agreed to forego the snotty overgown stuff that had taken up most of the morning of the first day and so we missed a fair few return tracks just east of Langdale End heading directly to the campsite for 2 pm. What an accurate estimate of time! So, an epic 4 days riding on absolutely fantastic trails for most of the way clocking up about 500 miles with no punctures or mishaps of any kind. The bikes coped with everything very well fully loaded with kit for 4 days (pants mostly). Bungey straps seemed to be the only weakness in the kit performance needing a few extras to be bought along the way. We were lucky with the weather; no rain or wind and blue skies. Perfect if a little warm. The End - but only for Ian our kindly van driver who was driving home to Bristol on Sunday to go to work or something equally foolish. Dave and myself were made of madder things. 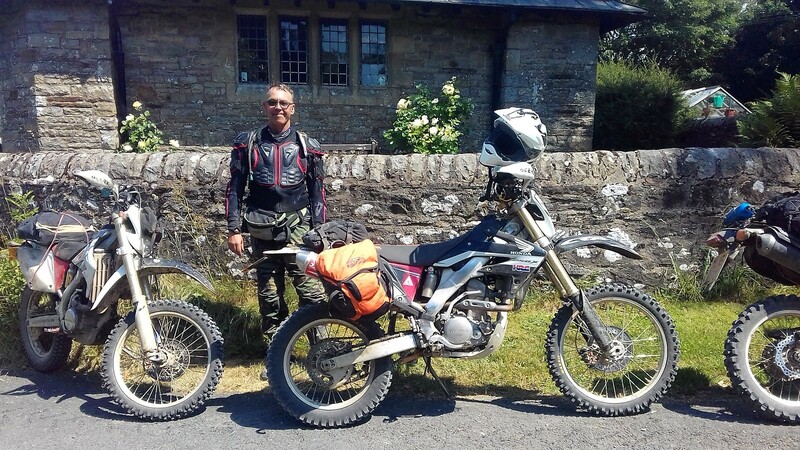 We were going to attempt my overland route from Scarborough to Bristol on the route I had worked out in 2010 but without the crashing part. Additionally we were doing it with tents and sleeping bags and tea making facilities! Proper eh! There are some lanes between Scarborough and Hull which are quite nice in a civilized sort of way compared to the lanes we had just been riding for 4 days, but the respite was welcome. We came across a monument 120ft high built in 1865 in honour of Sir Tatton Sykes, 4th baronet (1772-1863), by "those who loved him as a friend and honoured him as a landlord", as the inscription says. Volunteers no doubt then. At Hull we stopped briefly to see my dad and to change the oils on the bikes. Dave did his at the local Halfords store where he also bought a tent for £10! We had clocked nearly 600 miles by this time. On over the Humber bridge and a some easy field edge trails and a lot of small tarmac roads down past Lincoln and into the Wolds. We paused late afternoon for refreshments at the Dambusters Inn near Scampton, full of bits of old plane. They even sell Dambusters cheese which is a type of Cheddar! 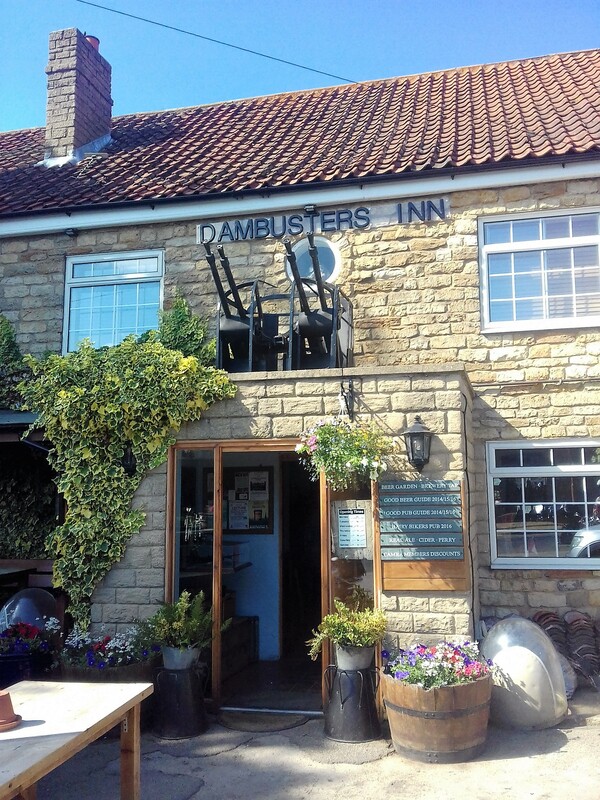 The Dambusters Inn near Scampton. Later in the day we were riding long stretches of the Ermine Way, one of several old Roman roads that traverse the country. Finally at around 6pm we located a campsite near Ancaster after about 70 miles. 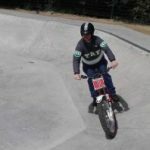 We had considered wild camping but as it was so hot and we’d been trail riding continually for 5 days we should have a proper camp with a shower! N.B we have been showering everyday anyway!! The campsite was however overrun with geese and their resultant deposits. Today we would go past Grantham, Melton Mobrey (didn’t get a pork pie OR Stilton!!) skirt over the top of Leicester and head into the National Forest. A grand name indeed for an area quite built up with posh houses. This is the area in which I crashed in 2010 breaking the mighty unbreakable DRZ’s radiator as well as bruising my ribs resulting in a get me home call to the breakdown services, so was beginning to look a little familiar. The route meandered along mostly field boundaries and farm tracks passing Mallory park race circuit for breakfast in Stoney Stanton. There is a diving quarry there with a cafe but it doesnt open til lunchtime. This was about 10:30. From here on we were following the line of the Fosseway Roman road which would eventually become our home turf once we got to Cirencester. But for now there were plenty more old roman roads to ride crossing old railway lines and canals. 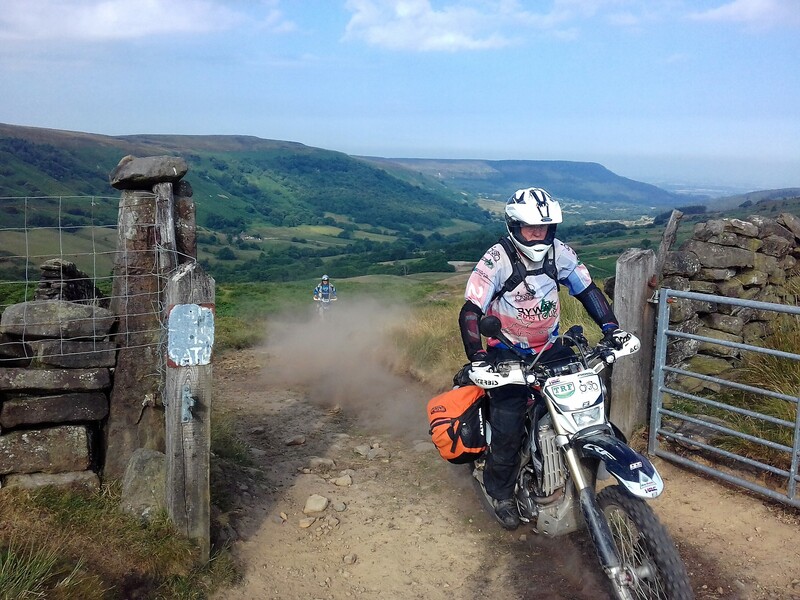 At the end of Monday we arrived home safe and sound having done 900miles in 6 days of riding. 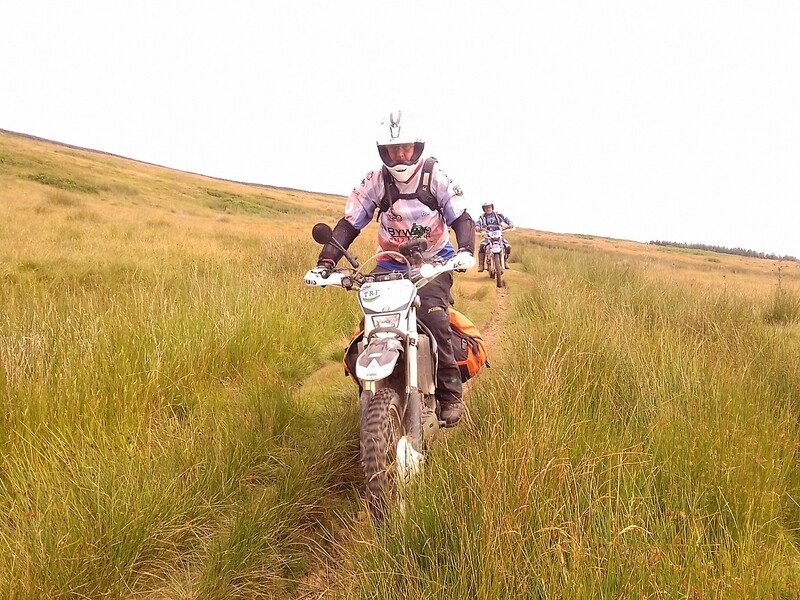 The first 4 being what you would call hard to moderate trail riding, the last two being more akin to Adventure Bike riding with lots of tarmac albeit on minor roads. 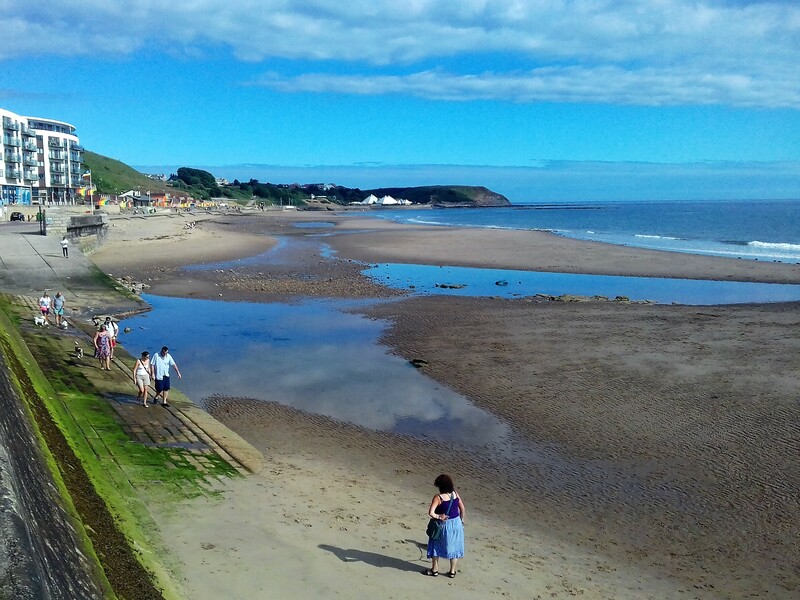 The Scarborough Camping & Caravanning Club campsite wouldn’t let us leave the van for a few days or even book us in for Saturday night as it was Scottish holidays – why that was relevant for booking a campsite escapes me. Early Wednesday morning, after parking the van in a salubrious local housing estate, we met the other riders at the Watermark cafe on the north promenade. There were quite a few big trail bikes to be seen but the majority were the usual TRF choice being 250-400cc enduro bikes. 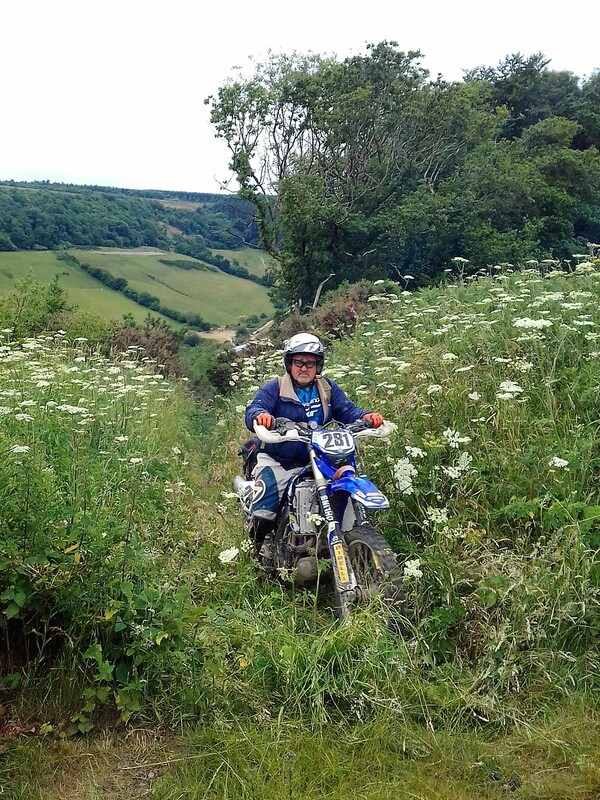 Ian managed to get the wrong side of a ditch and had to make a new path through the scrub and out onto the open track at one point – ‘lane clearing’, I think it’s called. As the day progressed the sun came out and the route took us higher up in to the NY Moors proper. Scotch Corner is a place we’ve all heard of but probably never been or at least never been to the village itself or to be more precise, the pub in the village of Scotch Corner. It is gorgeous – go! Awaking early and after the usual fettling – why do we do this in the morning and not at the end of the day? As any problems encountered in the morning lead to delay and frustration of the others! 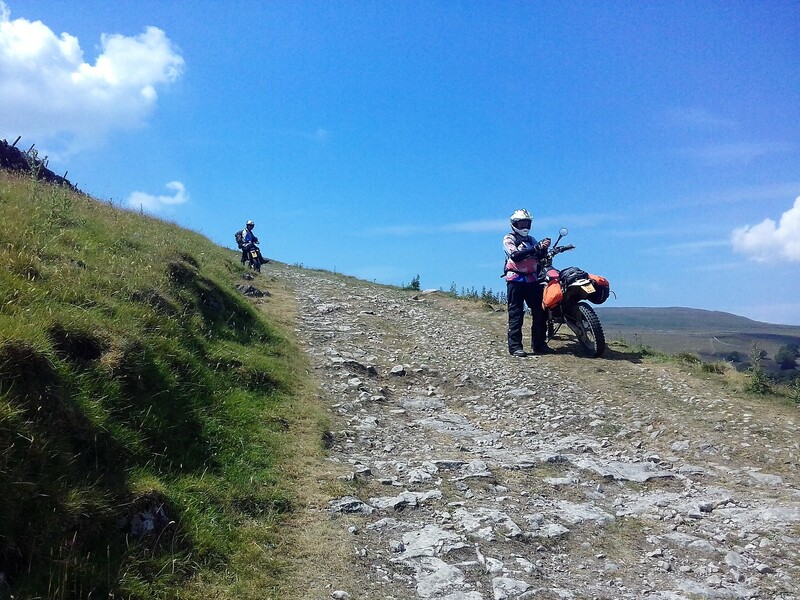 The descent from Fremmington Edge into Arkengarthdale was interesting and with fantastic panoramic views. Lunch about 2pm was at Hawes where we had iced coffee and Bakewell tart. So good it’s worth doing again Ian! And so the two day 2018 Teesside Classic Coast to Coast ride was over after 255 miles of mostly dirt track – but it wasn’t for us hardy souls, we were going back the way we’d come! 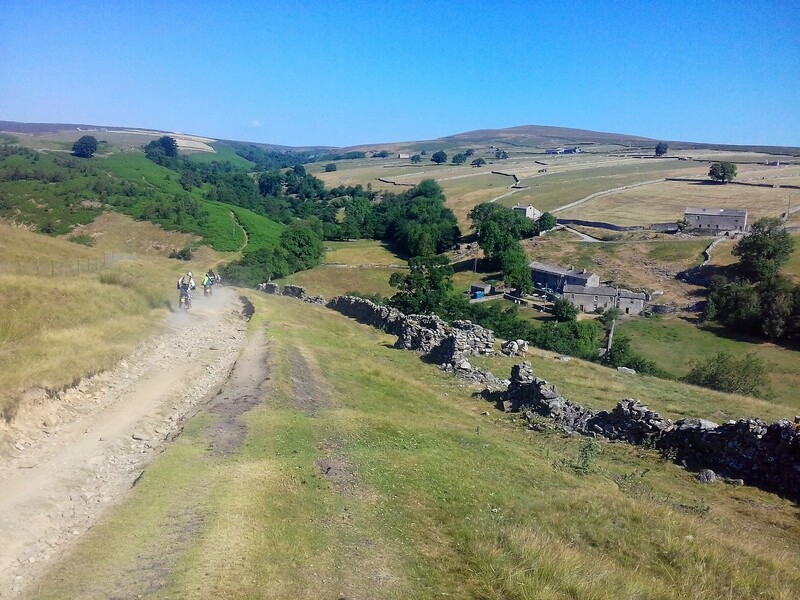 We again had iced coffee and Bakewell tart on Hawes – of course. 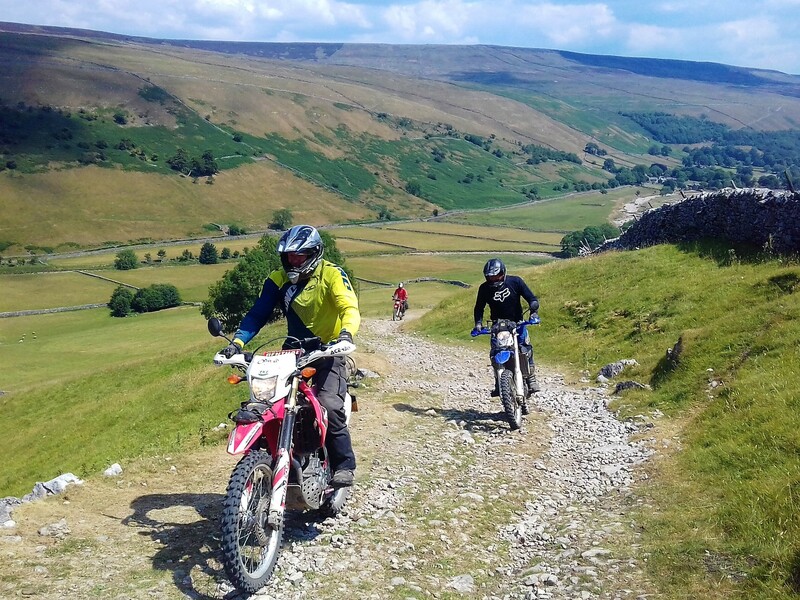 Next the climb up Fremmington Edge to the ridge above Reeth with the amazing panoramic views. The End – but only for Ian our kindly van driver who was driving home to Bristol on Sunday to go to work or something equally foolish. Dave and myself were made of madder things. 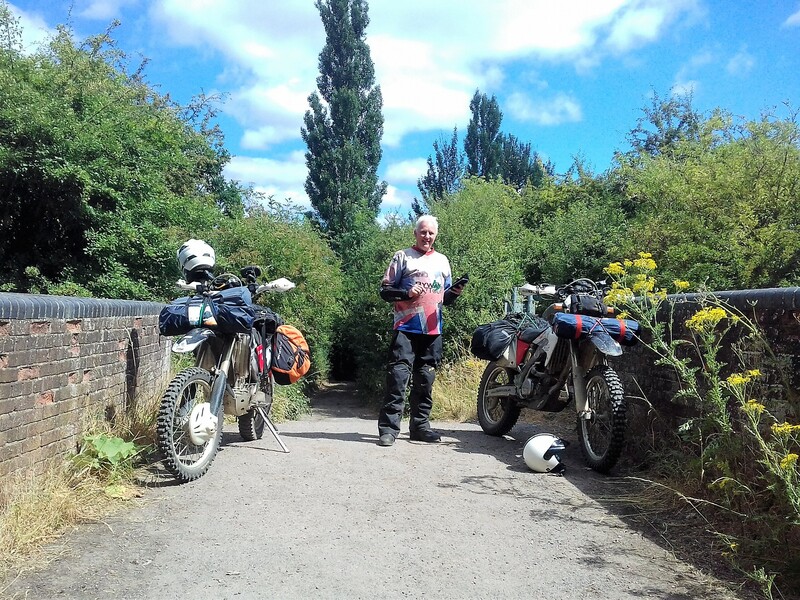 We were going to attempt my overland route from Scarborough to Bristol on the route I had worked out in 2010 but without the crashing part. Additionally we were doing it with tents and sleeping bags and tea making facilities! Proper eh! There are some lanes between Scarborough and Hull which are quite nice in a civilized sort of way compared to the lanes we had just been riding for 4 days, but the respite was welcome. We came across a monument 120ft high built in 1865 in honour of Sir Tatton Sykes, 4th baronet (1772-1863), by “those who loved him as a friend and honoured him as a landlord”, as the inscription says. Volunteers no doubt then.